Spacious bungalow with terrace and private garden area max. 3 persons. Our bungalow is located between Samaná and Las Galeras on the Punta Balandra. On a small palm hill you can enjoy the wide view into the bay of Samaná. In our 9000 m2 tropical garden you will find a private holiday home with a large terrace for 2, max. 3 persons. Experience and enjoy your holiday as individually as you. A private garden area, two-sea views, secure parking and Wi-Fi are included. The beautiful bay of El Frances is about 1.5 km away on a short walk or 2 minutes by car. Between December and March, you can watch spectacular whale jumps and cruise ships right from the terrace. We offer you exclusive nature holidays on Samaná, the most beautiful peninsula of the Caribbean. The bungalow was completed in 2018 and is only rented since March 2018. Since 2009 we travel the Dominican Republic. In Samaná we have found our personal paradise and fulfilled a lifelong dream with our own house. Here we spend the winter and enjoy the nature and tranquility. This house is the ideal retreat for you as an individual vacationer if you want nature, relaxation and privacy. The property is completely fenced and secured. Your free parking is right in front of the house. There is a safe in the house. Wi-Fi is included on request. For an additional charge, we will take over the cleaning of your personal laundry. On request we can provide you with free Wi-Fi. We have a large dining table for 4 people, as well as a small glass table with 2 chairs on the terrace. In front of the house is a private garden just for you. 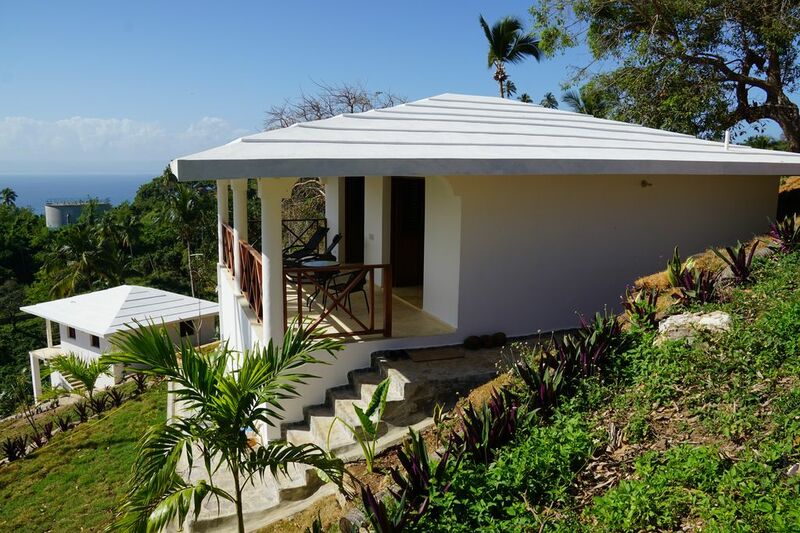 From the large covered terrace you have a breathtaking sea view in the bay of Samana in two directions. You also have a mountain view from there. The bungalow has a safe. On request you can book laundry and dry cleaning service, as well as breakfast for a fee. We can arrange an airport transfer or assist you with booking a rental car. We can also recommend trusted tour operators. In winter, we are on-site, in any case, always via WhatsApp or email to reach and open to all questions. Our access road is mountainous and a bit steep. However without problems with a normal rental car without 4x4 / 4x4 to drive.